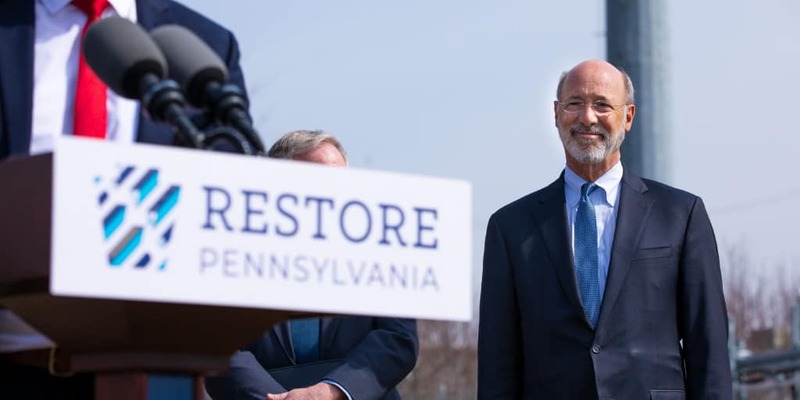 Harrisburg, PA – Erie County Council is the first local government organization to publicly endorse Restore Pennsylvania, Governor Tom Wolf’s aggressive infrastructure plan. “The County Council of Erie County hereby urges the Pennsylvania General Assembly to support Restore Pennsylvania. As a vital program and link between our past, present and bright future,” Erie County officials declared in the resolution, which was passed unanimously during a public meeting last month. Restore Pennsylvania will inject $4.5 billion over the next four years in significant, high-impact projects selected by local officials who are best situated to determine need. In Erie County, potential projects include blight remediation, green space development, broadband access expansion, flood prevention and recovery, and brownfield redevelopment. Three weeks ago, Gov. Wolf visited North East to discuss how Restore Pennsylvania can assist the borough with finding a solution to chronic flooding caused by Baker Creek. Department of Community and Economic Development Secretary Dennis Davin also visited the area to talk with local officials about how Restore Pennsylvania could assist with Erie County with remediating thousands of blighted properties. Restore Pennsylvania is a statewide plan to aggressively address the commonwealth’s vital infrastructure needs. Funded through a commonsense severance tax that the Independent Fiscal Office has determined will be primarily paid for by out-of-state residents, Restore Pennsylvania is the only plan that will help make Pennsylvania a leader in the 21st century.